Editor’s note: This article appears in the Fall 2018 issue of Stetson University Magazine. A year of sabbatical research put Terence Farrell, Ph.D., on the front lines in search of all things serpentine. For Terence Farrell, Ph.D., a recent sabbatical provided an opportunity to finish some research projects and begin other new ones. The common theme: snakes. More specifically: rattlesnake predation on giant centipedes, the evolution of rattlesnake venom and the hormonal control of snake reproductive behaviors. 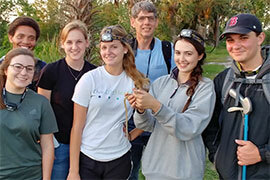 Another theme for the professor of biology and Brown Faculty Fellow: collaboration with Stetson students and faculty. “I keep an active research program, so I needed to get a lot of stuff done,” Farrell said of his sabbatical, which began in August 2017. “I mostly stayed on campus because a lot of the research was lab-based, but I also spent time at Lake Woodruff National Wildlife Refuge [DeLeon Springs, Florida] in the field. The National Geographic Society, for example, picked up some of the YouTube uploads. Sabbaticals are offered to Stetson faculty once every seven years. The request for a sabbatical is reviewed by a committee, and professors have the option of either taking one semester or a full year working on their research projects. Farrell took the full year, and he also used the time to learn new skills that will help him in his research moving forward. Since 1994, Farrell has published 23 journal peer-reviewed journal articles, five book chapters, two book reviews and five articles in the popular press. Many of Farrell’s papers have had multiple co-authors, and in 13 of them the lead author was an undergraduate or graduate student with little or no experience in scientific publishing. Students are frequently partners with their biology professor. “Collaboration with students is what Stetson is all about,” said Farrell. Farrell seeks to always work closely with his students to guide them through every step of the complex task of getting a manuscript written, revised and published. Among the students this summer was Sam McPherson ’19, who majors in aquatic and marine biology. Farrell has mentored approximately 100 students during their senior research projects. Fifteen of them were co-authors on published papers, and dozens of others have made poster or oral presentations at scientific meetings. Notably, in other papers, co-authors are experts with special skills or equipment who exchange their services for authorship. Farrell is often the last listed co-author on papers, keeping with a tradition in the natural sciences of having the leader of a research lab appear at the end in the list of authors. This deep engagement in research provided the students with a thorough understanding of the scientific process. In addition, dozens of other students not doing their senior research on snakes have made multiple trips to Lake Woodruff and other local natural areas to assist in the effort. More notable numbers: Eight of the students who completed their senior research project with Farrell continued to be deeply engaged in research after leaving Stetson and obtained doctorate degrees. Not that all has been easy or without incident. To read the remainder of the article, starting on Page 48, click here.